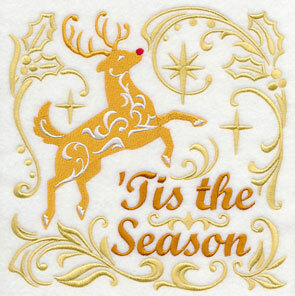 Bring a beautiful, festive look to your seasonal gifts and decor with new spirit of Christmas designs. Squares with energetic damask and graceful filigree add beauty and charm to pillow covers and wall hangings. Stitch them onto tree skirts and table linens for an extra-special holiday glow. Scroll down the page to see the variety! Clotheslines are delightful on shirts and aprons. 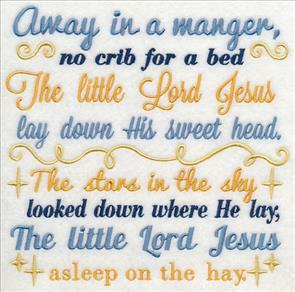 And, simple-yet-colorful lyrics to favorite songs and hymns are a fun and festive way to dress up tea towels. 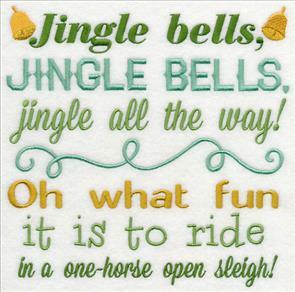 Classic Christmas images are paired with festive phrases. Add the richness of damask, and the elegance and energy of filigree swirls. The result is a beautiful addition to holiday gifts and decor! Add these designs to pillow covers and placemats. They're so merry, and bright! 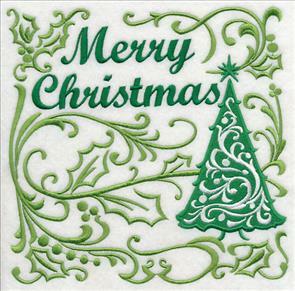 7.81" x 7.77" and 6.95" x 6.91"
5.88" x 5.85" and 4.86" x 4.84"
Christmas trees are all decked out with graceful filigree lines. And, they're framed against a backdrop of holly and berries! 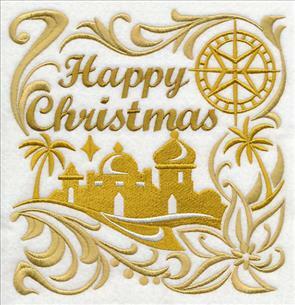 Choose Merry Christmas or Happy Christmas, and stitch these festive greetings onto door hangers and bell pulls. 7.79" x 7.81" and 6.91" x 6.93"
5.86" x 5.87" and 4.84" x 4.85"
Poinsettias are fresh and lively additions to Christmas decor. Add them to placemats and other table linens, then use a potted poinsettia as the centerpiece! 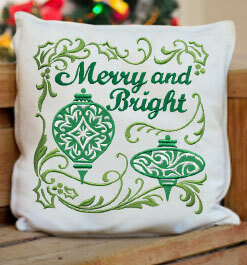 Elegant antique ornaments are the focal points in the Merry and Bright design. We stitched many of these samples in classic red and green, but choose colors that match your personal taste and preference. 7.81" x 7.76" and 6.95" x 6.91"
5.91" x 5.87" and 4.89" x 4.86"
5.91" x 5.88" and 4.89" x 4.86"
On the left, the text Very Merry Christmas is paired with a poinsettia in full bloom. Sprigs of holly and mistletoe are represented by curving filigree lines. On the right, a dove brings a peaceful feeling to Christmas projects. 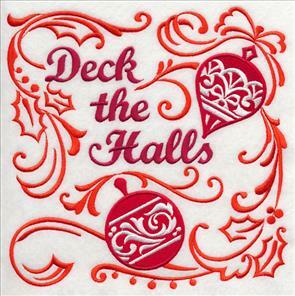 Make mini-quilts, wall hangings, and pillow covers to bring the spirit of the season to your home. 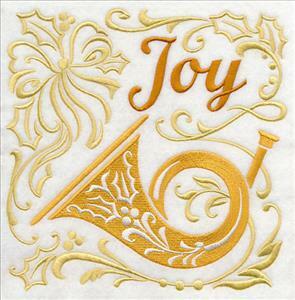 5.86" x 5.84" and 4.88" x 4.86"
5.84" x 5.83" and 4.86" x 4.85"
Stitch joyful sounds onto your Christmas gifts and decor! A trumpet is decorated with filigree holly, ready to add sweet melodies to pillows and tree skirts. 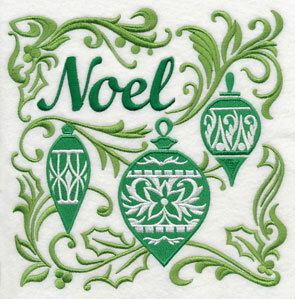 A trio of ornaments with the word Noel is a classic embellishment to placemats, wall hangings, and tree skirts. 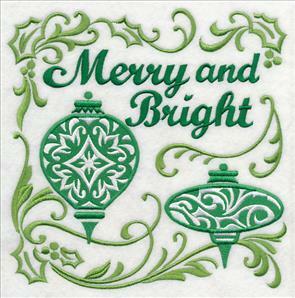 5.84" x 5.86" and 4.86" x 4.88"
Stitch them on tree skirts, wall hangings, and towels. 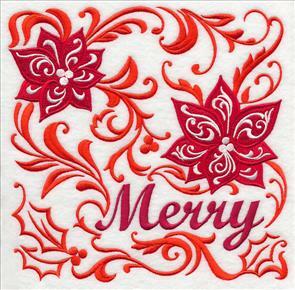 Make a set of mini-quilts or framed pieces to spread the spirit of the season throughout your home! If you have a couple of favorites, order them individually - just click the links above. And if you love 'em all, get them all in a design pack! There are different traditions that surround Christmastime. For some, it's a time of gathering together with family and friends. Others look forward to bringing home the Christmas tree, and decking the halls. 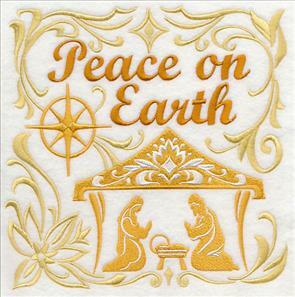 And for many, Christmas is a time to celebrate their faith and the birth of Jesus. The following designs reflect the peace and serenity of faith-based celebrations. 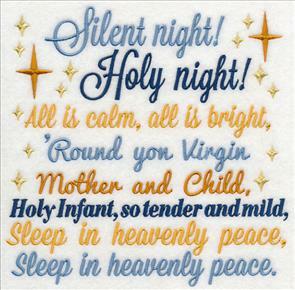 Angels sing joyful hymns. 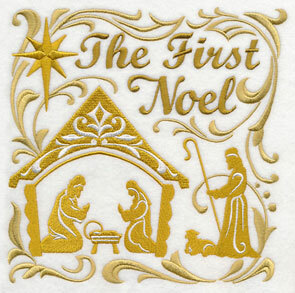 The Holy Family is silhouetted in a stable, under a star. A beautiful way to celebrate the season! 7.80" x 7.69" and 7.00" x 6.90"
5.93" x 5.86" and 4.91" x 4.86"
These square designs are resplendent in bold damask and elegant filigree. Classic images are stitched in bold, bright colors as the focal point. Muted colors are in the background, adding grace and flair, but not detracting from the subject. Arrange together onto a tree skirt, mantle runner, or a series of framed pieces. 5.88" x 5.85" and 4.88" x 4.85"
When making Christmas projects, we work with fabrics that aren't common during other times of the year. 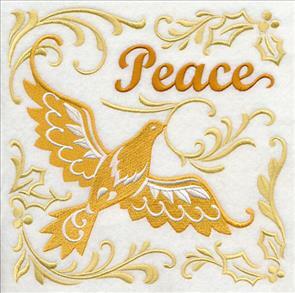 Embroider in bright silver or gold onto velvet, velour, or suede! Fabrics 101 articles give excellent guidance for stabilizer and needle choice. Keep them as handy references in your sewing room, and follow those tips for great results. 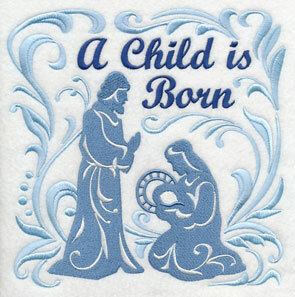 7.82" x 7.81" and 6.91" x 6.90"
Classic Nativity scenes and messages of Christmas blessings are spirit-filled additions to wall hangings and banners. 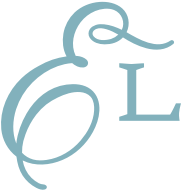 Welcome guests to your home with one of these designs on a door hanger or bell pull. 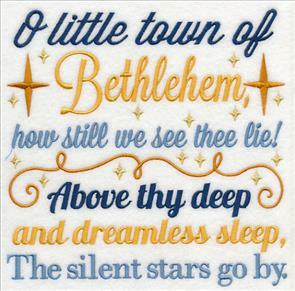 7.80" x 7.71" and 6.98" x 6.90"
7.82" x 7.81" and 6.92" x 6.91"
The town of Bethlehem is silhouetted and set in whirling, swirling filigree. 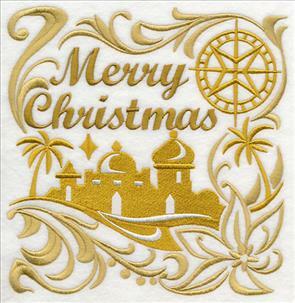 We stitched the samples in shades of gold, but choose the colors that work best with your project. 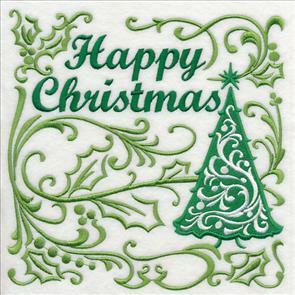 Both Merry and Happy Christmas versions are available to suit your preference. 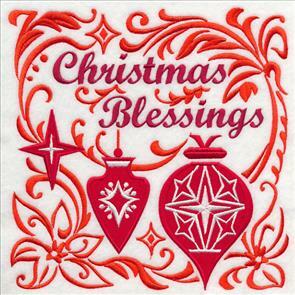 7.60" x 7.81" and 6.86" x 7.05"
5.86" x 6.02" and 4.86" x 4.99"
Bring the peaceful, serene spirit of Christmas to your projects with these designs! Pick one or two by clicking the links above, or get all 10 squares in a design pack. Do you want to "c" what is special about clotheslines? They're crafty. And creative. And colorful, too! They add a distinctly clever look to garments and couture. Embroider them onto shirt fronts (and, arc 'em near that neckline, too!). They're equally delightful on aprons, place mats, and towels. 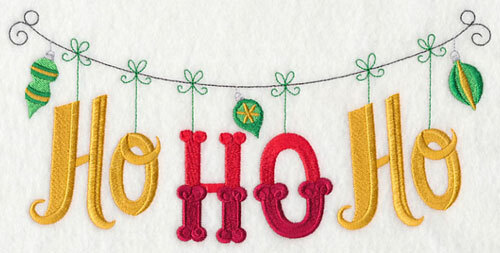 9.40" x 4.81" and 7.80" x 3.99" and 6.85" x 3.51"
Add colorful holiday greetings to your gifts and home with this Ho Ho Ho holiday clothesline. Colorful ornaments and delicate bows add a cute and charming effect. 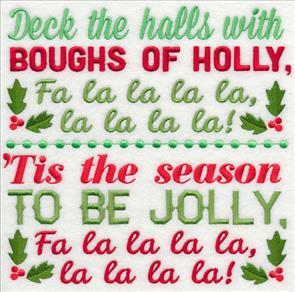 9.40" x 4.56" and 7.80" x 3.79" and 6.85" x 3.32"
Stitch the start of a favorite Christmas carol onto sweatshirts, shirt yokes, tree skirts, and tea towels! This colorful clothesline is also lovely on table linens. 9.40" x 4.48" and 7.80" x 3.72" and 6.88" x 3.28"
Bring a lively look to tea towels, pillow covers, and wall hangings! 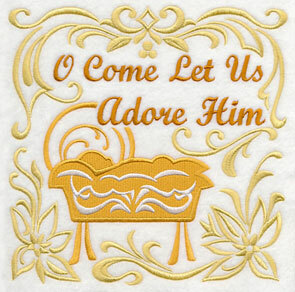 Lyrics to popular, beloved carols and hymns are paired with small and delicate images. They're simple to stitch, but very eye-catching. 7.81" x 7.72" and 6.94" x 6.85"
5.93" x 5.86" and 4.92" x 4.85"
Add to totes and handbags, and carry the jolly season with you wherever you go. Alternating colors give these simple designs so much interest and appeal! 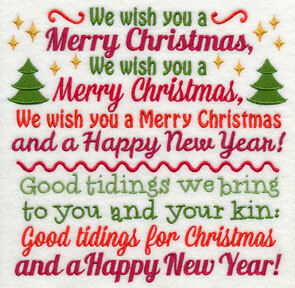 7.81" x 7.49" and 7.15" x 6.86"
7.81" x 7.67" and 7.03" x 6.91"
5.96" x 5.86" and 4.94" x 4.86"
Sing your favorite Christmas carols as you stitch these designs. 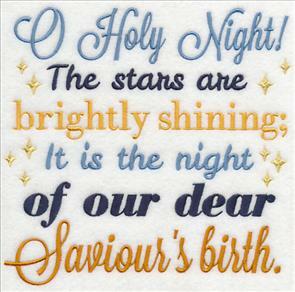 Gifts embroidered with lyrics to It Came Upon a Midnight Clear, or Away in a Manger, make wonderful gifts for religious and spiritual leaders. 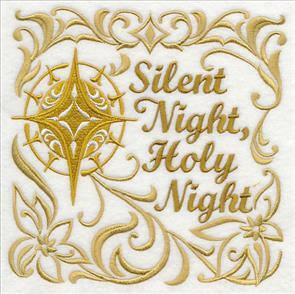 Make mini-quilts and wall hangings for pastors and ministers, choir directors, and members of your Bible study group. 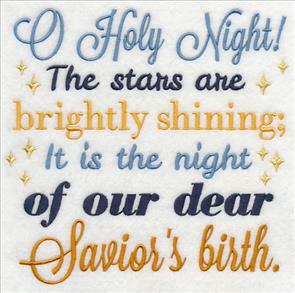 5.95" x 5.85" and 4.94" x 4.85"
O Holy Night is one of the most popular Christmas songs. 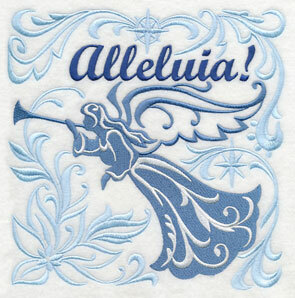 Two version are shown below - one with the spelling of Savior, one with the spelling of Saviour. Choose the one that you prefer for your spirited Christmas projects. 7.81" x 7.52" and 7.17" x 6.90"
6.08" x 5.85" and 5.04" x 4.85"
Turn the lyrics of this beloved hymn into a beautiful wall hanging! Embroider on cream, frame with navy blue fabric. Add sparkle and stars (or, seek a starry-sky fabric for the border). Add batting and interfacing for the best draping. The Piece-by-Piece Mini Quilt tutorial, or the Magnificent Mini-Quilt Tutorial, show techniques for this type of project. Be inspired by those tutorials, and tweak the steps to make your own. 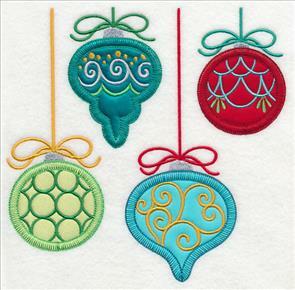 7.81" x 7.69" and 7.02" x 6.91" and 5.96" x 5.86" and 4.94" x 4.86"
A quartet of colorful ornaments is a creative way to deck your projects for the holidays. 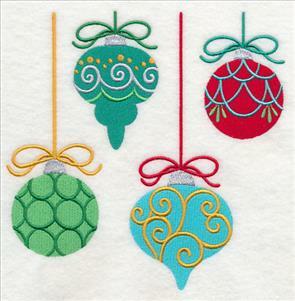 Strings and bows let them "hang" on pillow covers, placemats, and wall hangings! Two versions are available. The one on the left is stitch-filled. The one on the right is applique. 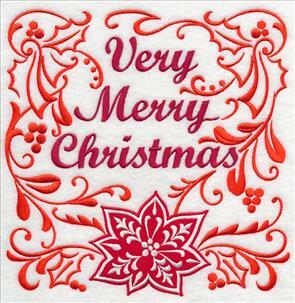 In the applique version, the ornaments are made with fabric, but the detail on top is still embroidery stitches. 6.00" x 5.86" and 4.97" x 4.85"
The square shapes lend themselves beautifully to pillow covers, banners, place mats, and tea towels. More ideas and inspiration can be found on the Projects page! Pick a project, then use one of the above designs. Some tweaking may need to be made, but each tutorial will lead you in the right direction. 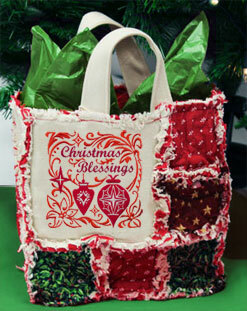 A popular project for Christmas is a cozy, country rag quilt bag. 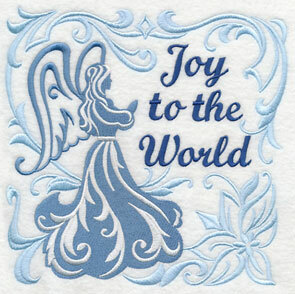 Embroider the design onto neutral fabric, and use fabric prints with festive patterns and icons for the squares. Use as a gift bag. Or, fill it with Christmas ornaments and tinsel, and use it as a centerpiece for your table! The tutorial that shows the steps is here. Adjust the project and the steps to make it uniquely yours! 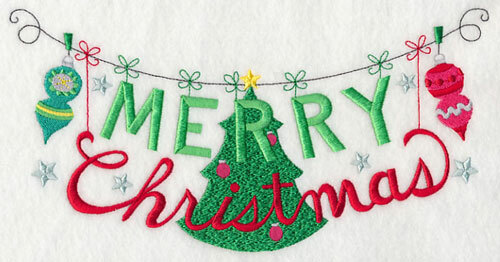 And, if you like the rag quilt style, be sure to see this rag quilt tree skirt project, and this stocking project. Square designs are a perfect fit for pillows. On the Projects page you'll find dozens of different tutorials for making pillows. Browse through them, and imagine them in your favorite fabric prints and colors. Then, pair your favorite project with one of the above designs. Make a pair for yourself, and gifts for family and friends! Fabrics 101 articles are excellent resources for your projects. They're linked on the HELP page and the Projects page for easy access. Each gives a design, needle, and stabilizer recommendation. Follow those tips to get picture-perfect results. If you're positioning the design in a certain area, you may find that a template is useful to use. A template is a printout of the design. It has horizontal and vertical axis lines so you can hoop the fabric straight, and get the design exactly where you want it. It is so helpful when placing designs on shirts! If you've not worked with templates before, this tutorial shows how.